Karlovich Anastasiya: Congratulations on your victory! How was the tournament going for you? Humpy Konery: I was not in a great form during the first part of the tournament – in most of the games I was clearly better but afterwards I was mixing up the things and could not convert my winning positions into the points. After the rest day I finally found my play and scored five and half out of six in the second part of Grand Prix. Closing ceremony of the sixth stage of FIDE Women Grand Prix took part in the Sharq Village and Spa in Doha, Qatar on 5th of March 2011. It was attended by FIDE Honorary Vice President Khalifa Mohammed Al-Hitmi, FIDE Vice-President Ali Nihat Yazici and other officials. Mr. Khalifa Mohammed Al-Hitmi delivered a speech to all participants and guests. Mr. Ali Nihat Yazici greeted all players and guests and congratulated the hosts of the tournament with an excellent organization of the event. The winners were awarded by Cups. The special keepsakes were given to FIDE Vice-President Ali Nihat Yazici, Head of the Appeal Committee Nona Gaprindashvili, Deputy Chief Arbiter Mahdi Abdulrahim. A special gift from the organizers was also presented to the most attentive spectators of the event. Photos of the closing ceremony are in the gallery. 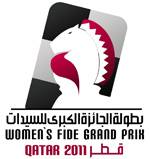 Click here and check the general standings of FIDE Women's Grand Prix 2010-2011. On 5th of March the Grand Prix of Qatar has ended. Humpy Koneru became a winner of Women Grand Prix in Qatar and also got the right to play the match against Hou Yifan. Round eleven was as thrilling as it was expected. After two quite peaceful draws between Dzagnidze-Chiburdanidze and Danielian-Stefanova, all the attention turned to the games which would identify the winner of Grand Prix in Qatar and also decide the participant of the match with Hou Yifan. The Chinese has already clinched the first place in the overall Grand Prix cycle and is a current World Champion among women. The first contender Nana Dzagnidze could not have an effect on the situation and was waiting for the result of the second challenger Humpy Koneru who needed to win the game in order to have a chance to qualify. Another important for the final standings game was played between Marie Sebag and Bathkhuyag Munguntuul. The French player also needed to win in order to share the first place. In such case Nana Dzagnidze would get a ticket to the match because Humpy Koneru would not get enough points in overall series of Women Grand Prix. After almost 5 hours of fighting Marie Sebag was defeated by Mongolian player and Humpy Koneru scored a crucial point! Photos of the 11th round are in the gallery. The sole leader of the tournament Elina Danielian suddenly lost to Pia Cramling while Humpy Koneru managed to win against Lilit Mkrtchian. One round to go the Indian player is half a point behind the top-runner and shares the second-third places together with Maria Sebag, who made a peaceful draw in the game against Maia Chiburdanidze. Indian regained chances to win the tournament and to qualify for the match with Hou Yifan if she manages to score against Zhu Chen tomorrow. The final results of the tournament also depend on the outcome of the game Danielian-Stefanova. Nana Dzagnidze lost the second game in a row and can not have an effect on the situation in the last round. The 11th round starts at 12 a.m. local time and promises to be spectacular. Photos of the 10th round are in the gallery.